On-the-go inspiration to help your group dream and achieve! On-the-go inspiration to help your group dream and achieve! 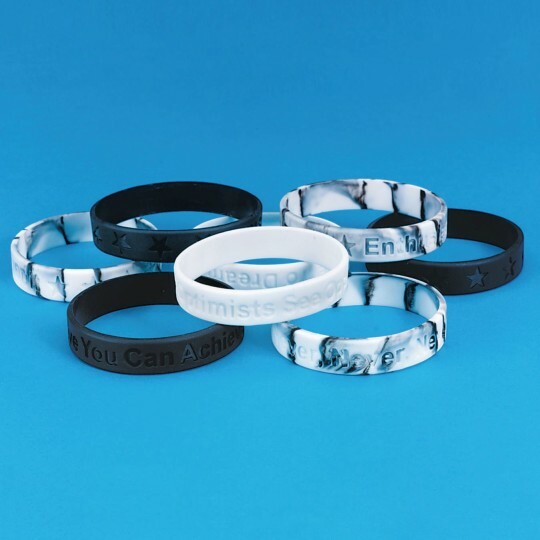 4 each of 6 popular phrases: Believe You Can Achieve (black), Optimists See Opportunity (white), Enthusiasm Ignites Greatness (black and white marbled), Reach For The Stars (black), Dare To Dream (white) and Never, Never, Never Quit (black and white marbled). One size fits most. Sayings may vary. Bought the bracelets for motivation while we were doing a high adventure trip with our Boy Scout Troop and Venture Crew. Sayings were perfect bracelets are one size fit all. Colors were good but wished I had more of a choice. Excellent customer service very prompt with delivery and answering emails!! 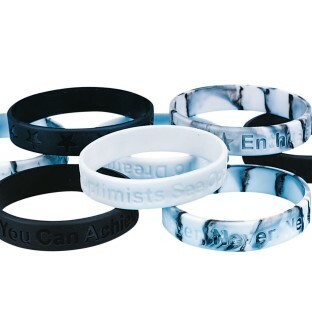 I hand out these motivational bracelets when a student does something outstanding. We give these to our children to wear for motivation and support. To remind the kids how amazing they are.